Even disposition, very attached to his master, very sociable, loving water even when very cold. The coat on the skull must fall onto the bridge of the nose. The beard is long and furnished; the moustache entirely covers the bridge of the nose. Round, broad, covered by hair. Back: Solid with well sustained topline. Loin: Arched, short and strong. Section 3. 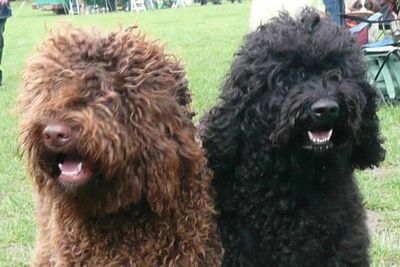 Water Dogs, with working trial. 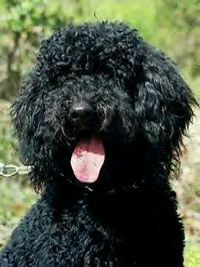 Water dog used for hunting wildfowl. 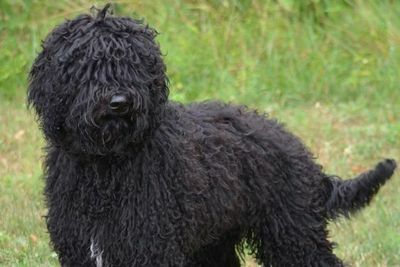 Like all water dogs, the French Water Dog is more than just a retriever; he must search for, locate and flush out the game hiding in the water vegetation. He then retrieves the game shot by his master. Very resistant to cold, he shall go to water in all weather. A very ancient breed, common throughout France, used for hunting waterfowl and described or mentioned in several works as early as the 16th century. Medium proportions, medium size, characterized by a thick, woolly coat which guarantees efficient protection against cold and damp. The coat forms a beard (French barbe) on the chin, which gave the breed its name (Barbet). Hindquarters: Upper thigh flat, hocks straight, feathering; presence of dewclaws. Feet fine and narrow, not covered by coat. Colours: Any colour other than those mentioned in the standard.